DECORATE YOUR BIKES: Decorate your bike wheels with fish, butterflies, stars and beads, which will make the bike more attractive. EASY TO INSTALL AND REMOVE: Clip-On design makes the bicycle beads easy to install and remove. APPLICATION: The plastic bike beads are suitable for all standard bikes spokes for any type of bike. 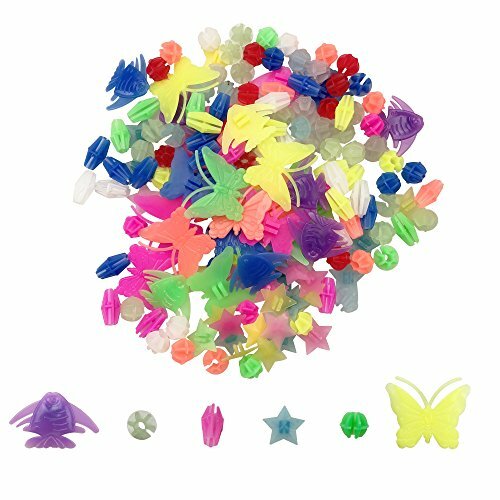 ☛PACKAGE: There are 170 counts different colors round , striped, star , butterfly and fish shaped spokes beads mixed in total. ☛GREAT GIFTS FOR KIDS: The colorful wheel beads are great gifts for kids. ☛ BIKING ACCESSORIES: The spoke beads are both suitable for the front and back wheels of the bicycle; your kids will have the coolest bikes. ☛ EASY TO INSTALL: Easy to snap the spoke beads on your children bicycle spokes and transform the wheels in seconds! ☛NOTE: 170 counts include 36 counts luminous round beads, which need to absorb sunlight first.